Amazon’s Kindle has been around for more than a decade, which started as purely an eBook reader, but now it offers a full line of Android tablets too, yet currently most people prefer Apple’s tablets - iPad considering of the performances, quality, display and etc. And for convenience, a great many people would also like to read Kindle books on iPhone. How can we put Kindle books on iPad and iPhone for reading? Amazon would love to have customers use their products of course, but its’ main focus is on the selling of the books. To that end, Amazon is very welcoming of various software platforms including iOS. As long as you purchase Kindle books, you can read them on various devices, with Kindle App. In this article, we are going to introduce how to read Kindle books on Apple devices with Kindle App step by step. Besides, we are going to show you a unique way to read Kindle books on iBooks without Kindle app. On your iPad or iPhone, go to the App Store – the app with all applications available for the iOS, type “Kindle” into the search pane at the top right of the interface and then tap the Search button, find the app, tap “Get” button and wait until the download is complete. Open Kindle app, enter your Amazon user name and password and then tap the “Sign In” button to register your iPad/iPhone to your Amazon account. Tap the "Cloud" tab at the bottom of the screen, and you’ll see all the books that are stored in your Kindle cloud library. Tap the cover of the book you want to read to begin downloading it to your iPad/iPhone. Once you download the book from the Cloud tab, it will appear in the "Device" section. Just enjoy your reading! Note: Every book available in the Device tab can be accessed offline, which means you can open and read it even when your iPad is not connected to the internet. 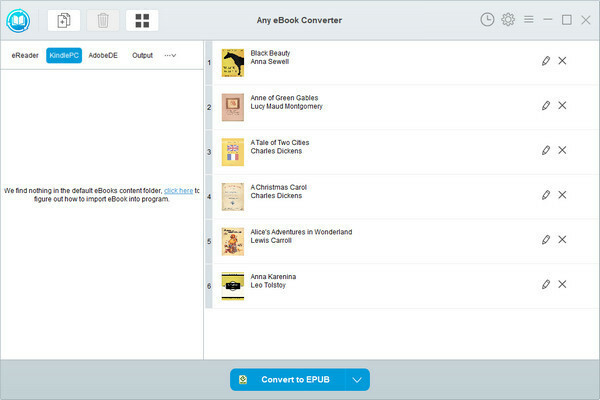 In method 2, we are going to apply the most popular eBook tool – Any eBook Converter, to remove the DRM from Kindle books and convert the books to a format that is fully supported by iBook. In this way, we are able to read Kindle books on iPad/iPhone without Kindle app on Apple devices. Before we get started, please have Any eBook Converter well installed on your computer. 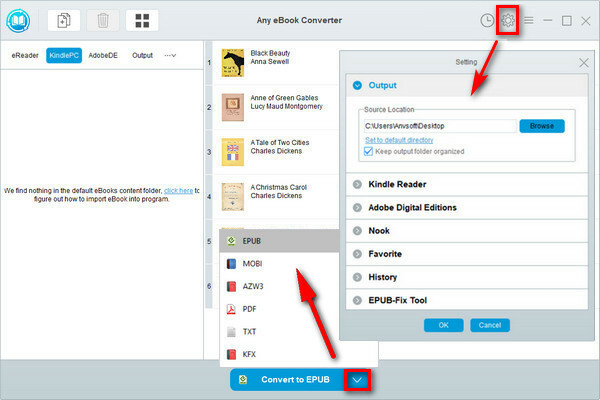 Launch Any eBook Converter, the program will automatically recognize your existent books (synced via Kindle for PC/Mac). 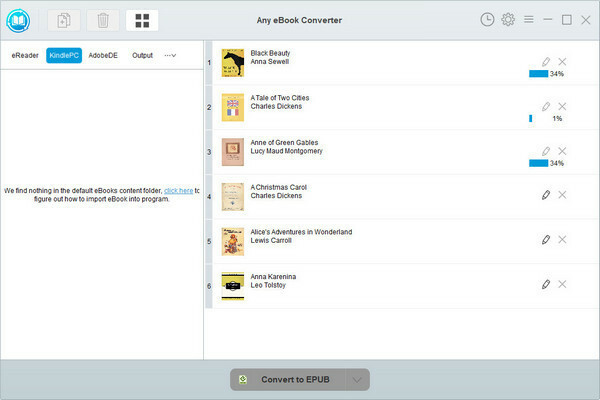 Drag the books you want to read on iPad/iPhone to the program, which will get rid of the DRM of the books soon. Click “V” on the bottom and choose “EPUB”, which is a common format fully supported by iBooks, as the output format. By clicking the “Settings” button on the upper right, you can customize the output path for the converted books. By clicking the “History” button on the upper right or directly going to the output path you set in previous step, you can find all the converted Kindle books on your local computer. Launch iTunes. Click "Add file to library" button to import the converted Kindle books to iTunes. Connect your iPad/iPhone to your computer with USB. You will see your iPad/iPhone show up on the upper right corner of iTunes. Click on your device and tap "Books" at the navigation bar. Tick the option "Sync Books” and then click "Sync" button on the bottom right corner to transfer your Amazon books to your device. Now open your iPad/iPhone and run iBooks, you will see those ePub books ready for you.